The Emory medical team at last year's Publix Georgia Marathon & Half Marathon, led by emergency medicine physician Brooks Moore, MD. 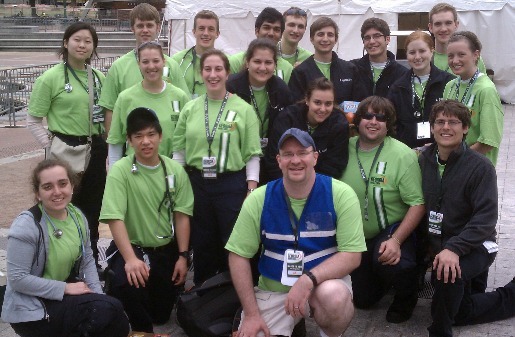 Providing onsite medical care for 18,000 runners and walkers is a big job, and Emory is prepared to do it. Atlanta's first major road race of the year, the Publix Georgia Marathon & Half Marathon, will surely test the health and fitness level of every participant – from the seasoned athlete – to the first-timer. Throw in March's unpredictable weather (a current forecast calls for unseasonably warm temperatures) and a slew of medical emergencies could certainly arise, including dehydration, heart attacks, sprains, falls and sunburn. More than 50 volunteer physicians, nurses and emergency medical technicians from Emory Healthcare will be on hand Sunday, March 18, to support the medical needs of every race participant and those in attendance cheering them on. The medical team includes an additional 36 students from Emory University School of Medicine, Morehouse School of Medicine and Philadelphia College of Osteopathic Medicine. Grady EMS and the DeKalb Fire and Rescue Department also are providing support. "We look forward to participating in this event for the fifth year," says Brooks Moore, MD assistant professor of emergency medicine at Emory University School of Medicine and emergency medicine physician for Emory Healthcare. "This is an incredibly valuable teaching experience for our physicians, nurses and EMTs, and our students get hands on training with this unique patient population. Many of our volunteers are fitness enthusiasts, and this allows them to mix the work they love with a hobby they love." If you're one of the thousands of participants tackling the marathon or half marathon this weekend, Moore offers tips for staying safe and healthy. Be ready for all types of weather. March weather in Atlanta can be unpredictable. Check weather reports, and be prepared for extreme heat or cold, along with thunder and lightening. Take the flags on the course seriously. Green = Proceed at your normal pace. Yellow= Slow down and proceed with caution because of moderate weather conditions such as high heat and humidity. Red= The marathon is no longer being timed. Proceed with caution to the nearest exchange point or seek immediate shelter due to severe weather conditions or other emergency. Black= The race is canceled. Please exit the course immediately. Be conscious of changing road conditions. Last year, more than 30 runners were transported from the course for musculoskeletal injuries like twisted ankles. Spanning the Sweet Auburn District, Inman Park, Decatur, Druid Hills, Virginia-Highland and Midtown, the course can offer some challenging road conditions such as loose gravel and pot holes. It's better to be safe than to be fast. Listen to your body. A good rule of thumb is to seek medical attention on the course if you're experiencing symptoms for which you would normally go to the doctor or call the ambulance. Chest pain, dizziness and confusion are particularly concerning and should be checked out right away. Identify yourself. Complete the identification information on the back of your race bib, so that should you not be able to speak for yourself due to injury or illness, medical personnel will know who you are and how to reach your emergency contact. The annual Publix Georgia Marathon & Half Marathon will take place this Sunday, March 18 beginning at 7 a.m. from Centennial Olympic Park. As in previous years, part of the marathon route runs from downtown Decatur along Clairmont Road, on North Decatur Road heading towards Emory, and briefly on Clifton Road and Fishburne Drive. Runners exit Emory’s campus via Dowman Drive. Travelers on these roads should expect lane closures and possible delays until approximately noon on Sunday. For more information on the Publix Georgia Marathon and the route, please go to www.georgiamarathon.com.